During the weekend of June 7-9, Daniel Flores (DTM, dacreativegenius), in conjunction with BINDERS Art Store in Buckhead, GA will be hosting a 24-hour comic book creation project. We caught up with Daniel to ask him about this unique event. I was born in East LA with a pencil in my hand. Art became the number one fixture in my life with strong images of Aztec Warriors and Chicano Pride. Pop culture played its part as well: my earliest surviving drawing is a line sketch of a shark rising to the surface of the water as a boat sits calmly at the top. The water surface is defined by a single line drawn across the page and the shark is nothing but a curved line with teeth in the middle. Some of my accomplishments include First Minority owned Tattoo Studio in Atlanta,Vantage Pointe Studios 1997-2005 and being featured in various Atlanta and National Tattoo Publications. In 2005 I participated in a group Art Exhibit that was featured inside the High Museum of Art in Atlanta, Art + Beats & Lyrics. Art is King and The Black Book Conversations are extensions of Mano A Mano, a series of group artshows I’ve curated, and include programs that give artists access to business information and professionals who can help an artist’s career get off the ground. Tell us about your upcoming event, comic book heroes + villains. In one weekend, participating artists, writers, inkers, pencilers and colorists will share their skills and work together. Open to Amateurs and Professionals, the goal is to gain experience in developing a comic book including character development, page timing, plot lines and character dialogue. Guidance in the comic book creative process will be led by Top ATL Comic Book Artists: Dawud Anyabwile, Joseph Wheeler III, Del Hewitt Jr and Afua Richardson. Each one an accomplished professional in their own right, they will be on hand to share their knowledge through the weekend. The idea for the comic book weekend came from my childhood desire to one-day draw comic books for a living, in the style of Stan Lee, Frank Miller and Simon Bisley. My favorite characters are Batman and the Punisher because they are regular humans who display extreme dedication and discipline in following their passion. Which artist has been your biggest influence? I always admired the work of Simon Bisley, Frank Frazetta and John Romita Jr. I spent many hours tracing over Batman, the Punisher and even real life muscle men like Schwarzenegger, Stallone and Lou Ferrigno. I learned to draw by following the art I saw on comic books and cartoons. I am also challenged by artists I come across in person. Is comic art your preferred style, or do you have other styles you like to create in? From an early age, the pencil has been my favorite tool. To this day I carry them everywhere I go. For a long time my only goal was to become a comic book artist. I got sidetracked in 1995 by becoming a tattoo artist, but I still draw characters and I have been slowly producing my own mobile game app featuring those characters I created for comics. Aside from art, what is your dream career? Besides my art life, helping people is another one of my passions. My wife and I are passionate about helping people learn to make their hobby into a career. That is where The Black Book Conversations mentoring comes in. We help people with what we know: the business of art. Besides body-painting people like superheroes, I also love to read books. History, science and non-fiction are my favorite past times. I don’t get to read much, stay real busy. but the body painting is part of some of my art shows. We do it for the fun! Heroes + Villains is sponsored by BINDERS Art Supply & Frames Store, The Hype and its organized by Art Is King as part of The Black Book Conversations Artist Mentor series. Registration is $25. You can register here – http://comicbook2013.eventbrite.com or find the event on Facebook. 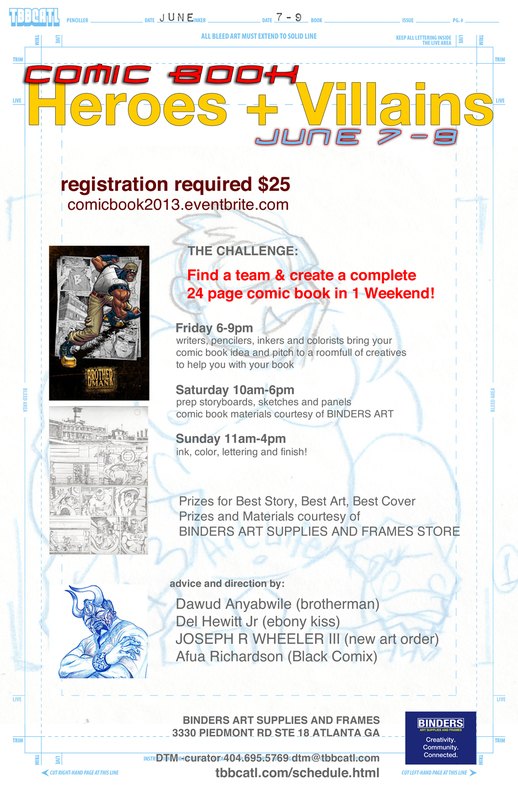 For more information on the comic book weekend, contact Daniel Flores at 404.695.5769 or dtm@tbbcatl.com. And get your pencils ready!